A joint venture partnership of Galliford Try Costain and Atkins (GCA JV) is currently completing work on a £150 million expansion of the Liverpool Wastewater Treatment Works. The joint venture was specifically set up to deliver detail design and construction for United Utilities Asset Management Programmes, and has been in partnership with the company for over 12 years. The completed Liverpool program will provide the works with the capacity to deal with 960 mega-liters per day, serving the needs of more than 600,000 people. Rather than rely on the traditional 2D workflows for detail design of this flagship project, the GCA JV Board of Directors recognized that the delivery of the project could be greatly enhanced by employing Building Information Modelling (BIM). As civil and structural detail designers for the project, Atkins, one of the world’s largest engineering consultancies, with more than 100 offices in the United Kingdom, was charged with leading the implementation of the BIM strategy. The client, United Utilities, was responsible for the concept and definition phases of the project, with GCA JV taking over for the implementation phase and providing detailed design and construction services. A number of complexities stood out on the project. 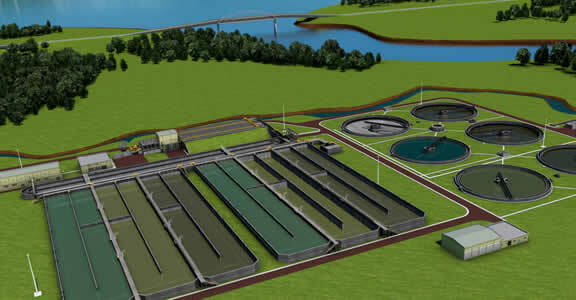 The new plant is located in an existing operational dock, which is subject to a preservation order by English Heritage. This meant that the design had to avoid damage to the walls. The dock was also still operational, so the gates had to be closed and a permanent closure constructed prior to dewatering, sand infilling, and piling. Starting with the main SBR (sequence batch reactor) structure, the design team created a 3D model of the piles, base and wall starters, cutting 2D plans, and sections from the model using AutoCAD and AutoCAD Plant 3D software. The 2D drawings were then sent to the Global Design Centre in India for reinforcement detailing. The speed demonstrated in this “new” workflow helped to quickly allay any concerns that designing in 3D would slow down the production of the 2D construction drawing deliverables. 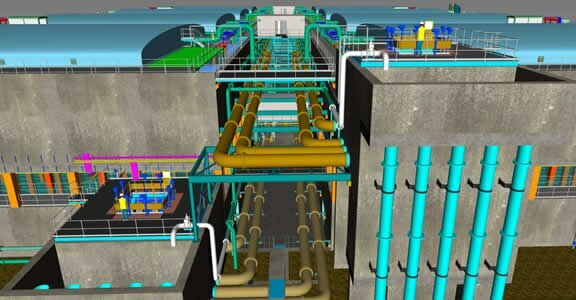 On a project the scale of the Liverpool Wastewater Treatment Works, there are dozens of participants, with subcontractors and the equipment supply chain submitting detailed models and designs for their particular elements of the project. 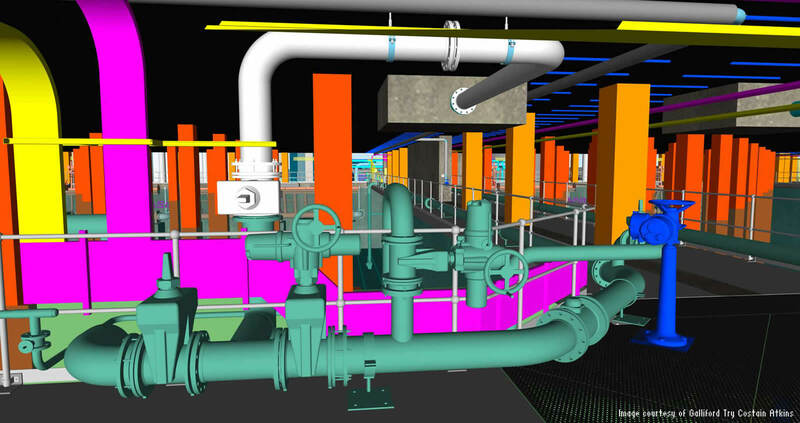 The detail design itself even involved an AutoCAD Civil 3D model, which was used with barometric survey data to help calculate silt volumes contained in the dock prior to construction commencement. 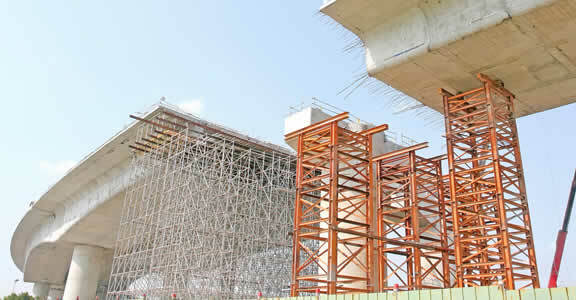 The team also used Navisworks Manage software to create a federated model of the project for coordination and design review. The team used the model to engage partners, suppliers, and the client’s operations personnel early in the design process to help provide a more optimal solution. The GCA design and construction team turned to Navisworks Manage again when it came time to plan construction. They linked the model to the construction schedule and created a 4D construction plan. As the project has moved to the field, the team is still using the model. BIM 360 Field software lets the team refer to the Navisworks model on Apple iPad mobile devices at the point of construction. Using BIM 360 Field aids the team’s efforts to monitor and resolve construction, installation, commissioning, and health and safety issues. 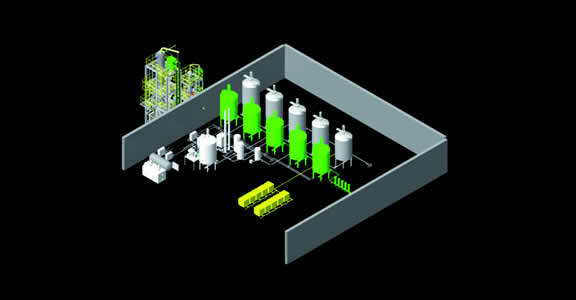 In addition, the Navisworks model was used by organizations in the supply chain for pricing exercises. Rather than using a labor-intensive process of developing traditional 2D drawings, suppliers were encouraged to measure from discipline-specific models that showed design intent. This helped reduce the risk of measurement errors, contributing to improved accuracy and leaner pricing. The successful suppliers were contracted to supply their own detailed design models, which replaced the design intent models. 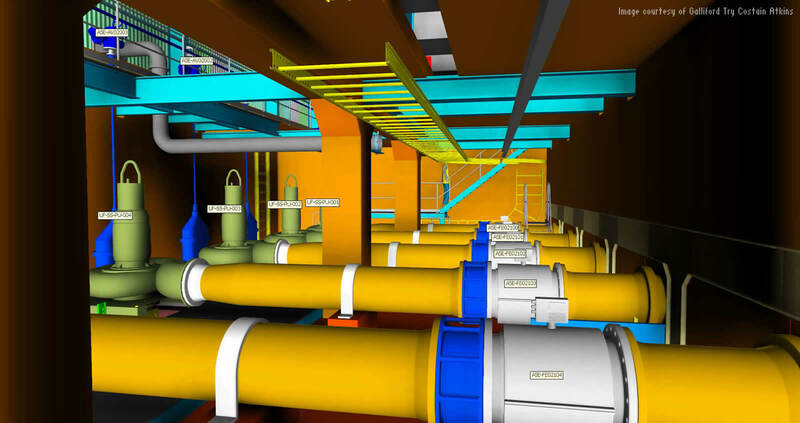 The success of BIM implementation was ably demonstrated by the recent completion of 386m of large diameter process pipework ranging from 1600mm to 2200mm. The pipework was designed in the BIM model, fabricated off site, and installed between a number of fixed points with no on-site cutting. 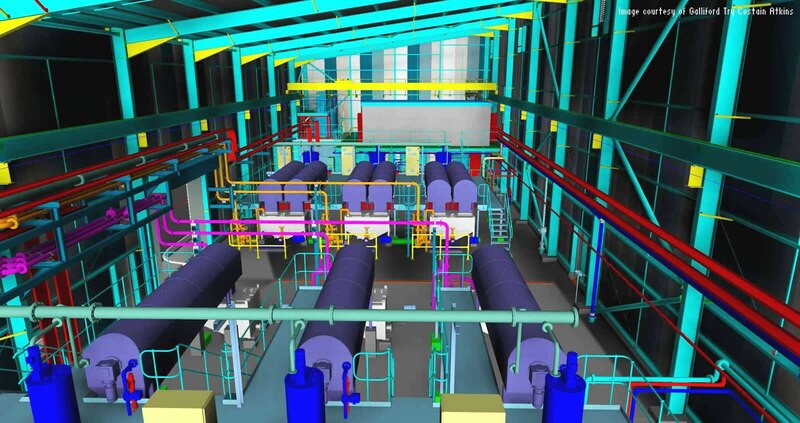 Using BIM processes, the company reduced costly errors, as well as improved design accuracy, overall coordination, and productivity. 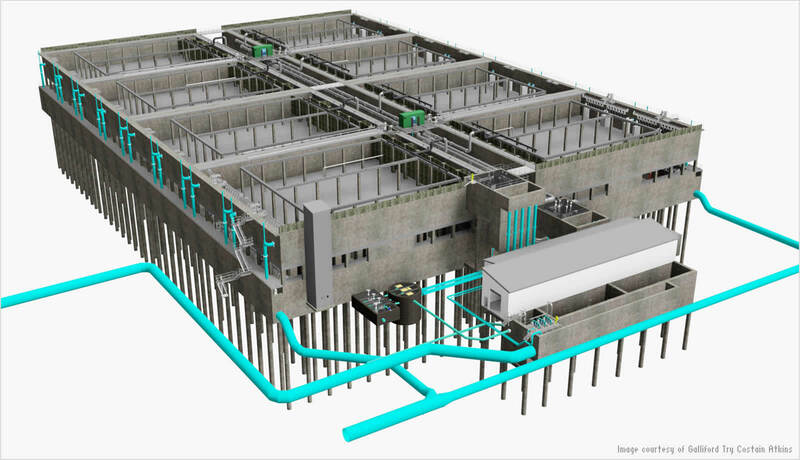 The company used BIM to enhance coordination, buildability, operability, and maintainability on a £150 million wastewater treatment plant expansion project.